No, the title is not a reference to towels, Vogons or the Question to the Ultimate Answer of Life, The Universe and Everything. 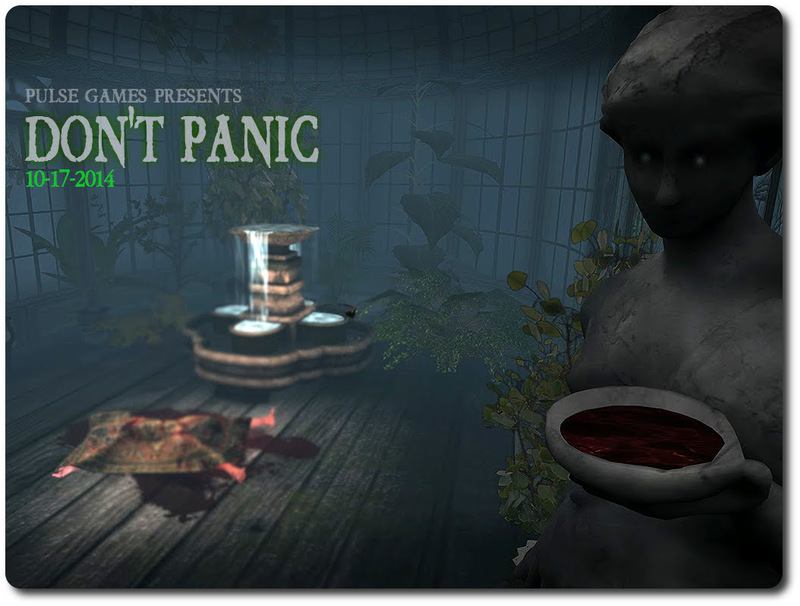 Rather, Don’t Panic is the name of the 2014 Halloween offering from Pulse Games, which is billed as a “completely interactive fear experience with multiple levels, challenging puzzles and fantastic prizes”. I’m not sure about the “fear” aspect, but there is no denying that Don’t Panic is an involved and entertaining multi-level interactive experience. In it, you take on the role of a television ghost hunter / mystery solver competing in a challenge being run by The Panic Channel, “the hottest cable network for the paranormal”, to explore Carver Mansion. This is a fabled, if now run-down, family home, once the scene of tragic events and formerly a mysterious monastery where Weird Things are rumoured to have happened. 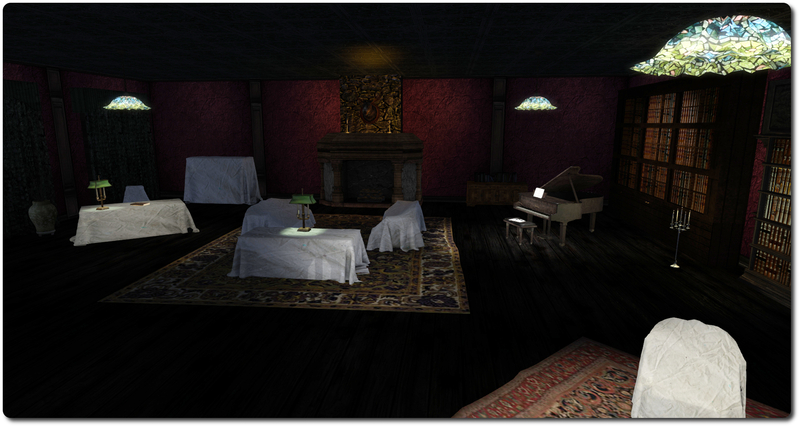 The challenge sees you and your producer, Lily (an NPC who remains in the production van, passing information to you as you explore the house), up against the famous Jack Hunter and the Spectre Collectors in exploring. Jack and his team have actually stolen a march on you; they’ve been on-site for a while; but while you arrive to find all their equipment set-up and ready to go, the team have disappeared. Are they the latest victims in the mansion’s dark history? Don’t Panic – their equipment is here, but where are Jack Hunter and his crew? and what of the Carver family? From the starting-point, you’ll need to collect your game pack and wear the HUD (PKE meter) and the tactical headset. There are other items in the pack, but they’re not essential to playing the game. The HUD provides essential information and also tracks your progress, allowing you to break-off from playing, should you need to, and then resume at a later time. 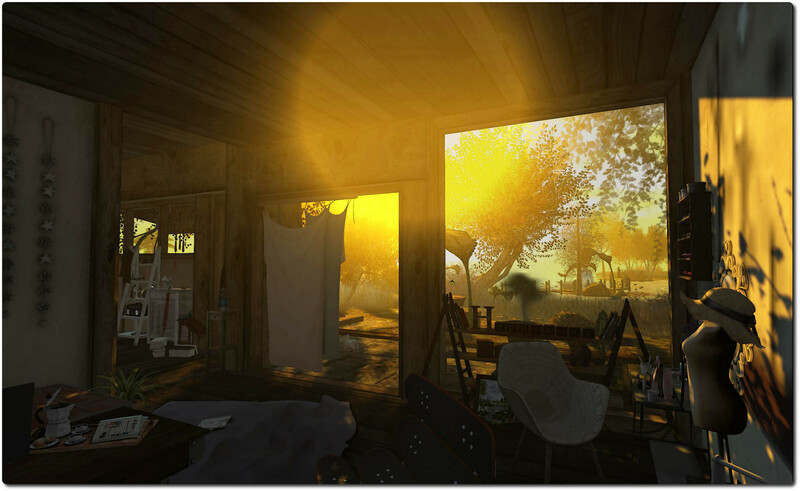 The headset provides a projected light which you will need if you’re running the viewer using the region windlight. The pack also provides gameplay instructions – which should be read and followed. Do make sure you heed the notes on minimising lag and divesting yourself of unnecessary facelights. It’s also a good idea to have sound on as well, although essential information is also delivered through chat. Once in the house, it’s a case of explore, touch and follow the hints (which take various forms). When I say “explore” and “touch”, I mean exactly that; don’t take anything for granted, and take your time. There are things to be found and collected (recorded by your HUD) which are vital to your progress, some of which are obvious, some perhaps not so.And don’t forget the prizes that are scattered around, waiting to be claimed. There is also, it has to be said, a wonderful element of wry humour throughout the mansion; it pays to be observant in order to find it. As the challenge is spread across two regions there is some teleporting to be done – although not so much as you feel you’re being bounced around from pillar to post. 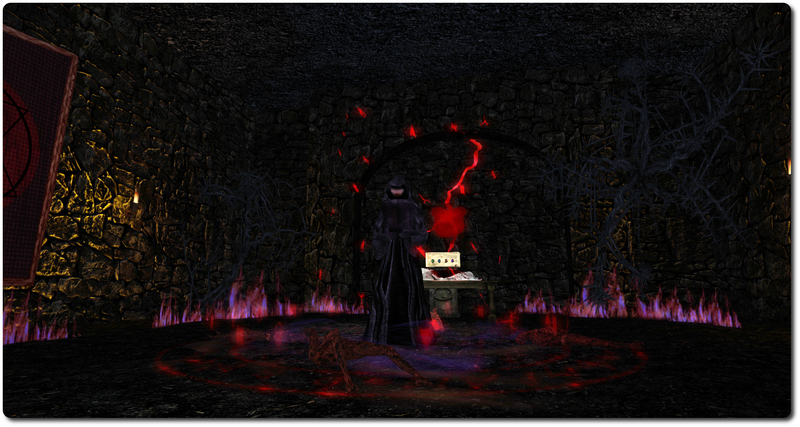 Some teleports require the solving of puzzles as does getting through certain doors. Working my way through these had me thinking about how Experience Keys might further add to activities like this – not that Don’t Panic misses anything; the few times the map pop open to facilitate a teleport doesn’t actually interfere with the fun of things. Don’t Panic – discovering the truth …? It’s fair to say that a huge amount of creative thought has gone into Don’t Panic, and a couple of the riddles in particular really do engage the grey matter. This all makes it a thoroughly entertaining activity which – despite the description – doesn’t rely on shock horror elements to achieve its goal. What I particularly enjoyed about it, aside from solving the puzzles, is that there isn’t necessarily a single route to the solution. For those who do like solving puzzles, it is possible to circumvent collecting all the clues and slip directly to the denouement. Nor does this spoil things – it simply gives an excuse to go back and explore those bits missed in jumping to the end. Similarly, for those who may have missed a clue, it means frustration can be avoided in retracing steps and trying to find whatever was missed. All told, an engaging, fun challenge which exercises the brain nicely without ever belabouring things. Recommended. On Tuesday, October 21st, the Main channel was updated with the server maintenance release previously deployed to the LeTigre and Magnum RCs in week 42. This update includes a crash fix and improves the delivery pipeline for abuse reports. LeTigre and Magnum should both be updated to the CDN for texture and mesh fetching. On Wednesday, October 15th, the Lab issued a Grid Status update on potential problems accessing external websites using the viewer’s internal browser. The notice was issued as a result of the Padding Oracle On Downgraded Legacy Encryption (Poodle) vulnerability reported by Google. At the time the notice was released, the Lab indicated they were working to fix the issue (via the removal of SSL v3.0 support within the viewer’s browser). This work was completed at the end of week 42, and resulted in the release of the Browser Fix RC viewer, version 3.7.18.295539. On Monday, October 20th, the Browser Fix viewer was promoted to the de facto release viewer. Further information on it and the POODLE vulnerability can be found in a separate article in this blog. There have been some mixed results for those Mac users updating to the 10.10 Yosemite version of OS X, which reached a consumer release status on October 16th. While most of those updating have found it relatively smooth, there has been a report of keyboard shortcuts borking, although there is a workaround should others encounter the same problem – see here. A potentially more widespread issue people may encounter is that with Yosemite, Apple have apparently reverted to older nVidia drivers (as reported by Cinder Roxley at the Open-source Developer’s meeting on Monday, October 20th). One JIRA on the matter has already been filed (see BUG-7575), although if Apple have chosen to roll back some / all of their default drivers, there’s not a lot the Lab can do about matters. Cinder also reports that Yosemite makes greater use of OpenGL, which she indicates can tax GPUs further. Following the scheduled Wednesday deployment, all of the RCs should be using the CDN. This represents around 30% of the total grid, possibly a little more, given the existence of Snack. The BlueSteel deployment does not seem to have resulted in the kind of performance issues experienced during the expansion of Snack to 250 regions, suggesting the latter problems were most probably down to overloading the sim hosts with too many high volume (in terms of avatar numbers) regions. If all goes well in the coming week, it is likely that the Main channel will gain CDN support in week 44. Many of you have helped us test that at Thursday’s beta user group, and that’s now on the newest version. Those are back-end servers … when you send something to group chat, it goes from the viewer to the region you’re on, then to the (new) back-end chat servers, and from there it’s distributed to everyone in the group. As well as working on the update issues (see my previous group chat updates), the Lab has been brainstorming ideas on how groups might be configured differently. There are a lot of groups that have very heavy chat usage, and others where chat is actively discouraged in favour of outgoing notices; however the latter are handled exactly the same as those where chatting goes on, generating updates as people log-in and out, etc., even though these aren’t actually required. Exactly what might be done is unclear at this time, but it would appear ideas are being put forward and discussed. 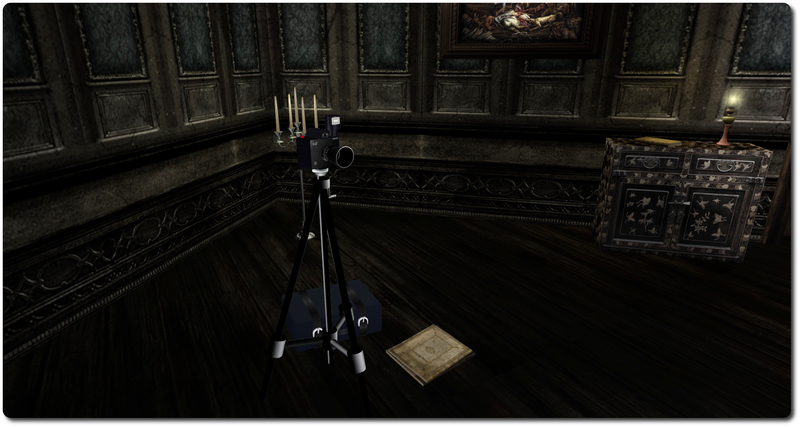 Back in September, I took my first stab at producing a “proper” piece of machinima. by that, I mean actually filming in-world and then editing the thing together, rather than just editing images and adding a soundtrack. The results were mixed; while the PC had the omph to do things, I encountered issues with video formats and conversion which resulted in the first attempt suffering from degraded video quality. Since then, I’ve not really had the time to focus on things as fully as I would like, but I have been tinkering as and when I can, and getting some guidance – I’d particularly like to thank Ormand Lionheart for her invaluable assistance and suggestions, and also (while he isn’t actually a Second Life user), JN, who also came to my aid when I encountered issues with my updated editing software. For my second test, I took the liberty of filming on Jordan Giant’s evocative The Colder Water, about which I blogged back in August. The selection was based both on the fact that I love the environment and setting on the region, and the music I wanted to use, Doulogue by Javolenus seemed to fit the region. The video is by no means perfect – had some issues with the actual recording when in-world, which has resulted in a slight jerkiness in the video. I also need a lot more practice with the Space Navigator (and get it set to my liking); but hopefully the improvements in overall quality can be seen, now I (sort-of) know what I’m doing.